The Creative Hand Studio - Drawing Class - Make Time for Art! Hi Art Enthusiasts! Would you like to improve your drawing skills 100% and create more expressive drawings? 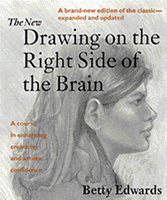 You will, if you sign up for my 6-week course, Drawing on the Right Side of the Brain. Using exercises from the well-known book by Betty Edwards, you will learn to see more perceptively and improve your skills in an amazingly short time! There also will be homework exercises which will help you progress quickly. If you're interested in taking this class, please email me at barbara@bsolbergart.com. I can't wait to see your progress! If you are interested in taking a drawing or pastel class, email barbara@bsolbergart.com. Copyright © 2005-2016 Barbara Solberg. All rights reserved.